Many white Americans in the Southeast wanted the United States to take over Florida. Slave owners in Georgia were angry because slaves sometimes ran away to Florida. 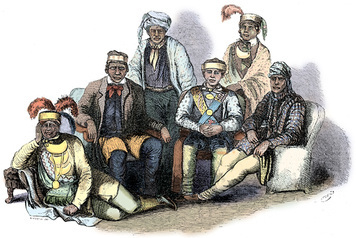 (Seminole Indians welcomed some of the escaped slaves.) In addition, white landowners in Georgia were upset by Seminole raids on their lands. Over the next few years, Spain’s control of Florida weakened. The Spanish government could do nothing to stop the raids on farms in Georgia by Seminoles and ex-slaves. Andrew Jackson Invades Florida In 1818, President James Monroe sent Andrew Jackson—the hero of the Battle of New Orleans—to Georgia with orders to end the raids. Jackson was told that he could chase raiding Seminoles into Florida. But he did not have the authority to invade the Spanish colony. Despite his orders, Jackson marched into Florida with a force of 1,700 troops. Over the next few weeks, he captured Spanish military posts and arrested, tried, and executed two British subjects for stirring up Indian attacks. He also replaced the Spanish governor with an American. Spain demanded that Jackson be called back to Washington and punished for his illegal invasion. “Govern or Get Out” Fearing war, President Monroe asked his cabinet for advice. All but one of his cabinet members advised him to remove Jackson and apologize to Spain. The exception was Secretary of State John Quincy Adams. Rather than apologize, Adams convinced Monroe to send a blunt message to Spain. The message was this: govern Florida properly or get out. Equally fearful of war, Spain decided to get out. In 1819, the Spanish government agreed to yield Florida to the United States. In exchange, the United States agreed to pay off $5 million in settlers’ claims against Spain. The United States also agreed to honor Spain’s longtime claim to Texas. Not all Americans were happy about leaving Spain in charge of Texas. One newspaper declared Texas was “worth ten Floridas.” Even so, the Senate ratified the Florida treaty two days after it was signed.